Mr. So went into the final match with Ray Robson undefeated in his four days of competition. Ray is one of his best friends and a former room-mate at Webster University in what was an expected match up for first place. “I knew this would be a very tough tournament to win, having so much talent here, which makes this win so amazing,” said So as he humbly received his first place cash award. Mr. So went into the final round as the crowd favourite but it was still a challenge despite his success as a former child chess prodigy and the eighth youngest grandmaster in chess history. The tournament featured both professionals and amateurs playing for the unprecedented prize pool. Prizes went down to over 50 places in six different section. Over 60 percent of players went home with a cash prize. 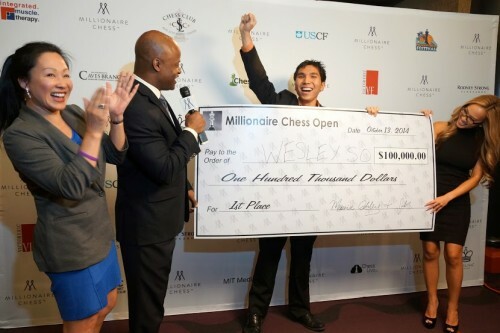 The inaugural Millionaire Chess Open took place October 9-13, 2014 in Las Vegas Nevada at Planet Hollywood and holds the record for the highest stakes in chess. Entry was $1000 with a chance to win up to $100,000 for a total of $1,000,000.